People hire me to to find deals on cars. Sometimes I save folks thousands off a new Mercedes or simply find the best value in the pre-owned market. It really all depends on the customer. Of course my all time favorite is when I found a client a RWD, manual, E91 3-series wagon with less than 400 miles on it. However, all of those deals pale in comparison to these two dudes in Japan who bought a car for a 1000 yen, or about $9.80. "Honestly, we were ready to pull the trigger on our purchase right then and there. In negotiations, though, many people say you should reject the first offer, so we decided to push our luck just a little bit. "Is 1,000 yen really the best price on the car you can give us?" we asked. To our shock, the dealer admitted they could indeed knock another 20 yen off for us. With that, we were sold, and so was the car." Of course the vehicle price alone is not the only expense they incurred, there was also the mandatory insurance and registration that added less than 90,000 yen ($886) onto the total cost. But unlike my local shady used car dealer that carries cheap vehicles that are about two steps away from the junkyard, the dealership in Japan conducted business with the utmost professionalism and courtesy. "Even with the ridiculously low amount of revenue the transaction was bringing into Minikuru, the dealer didn't treat us like second-class customers at all. As a matter of fact, as we arrived in Nagoya to take possession of our new ride, we were surprised to see the Minica parked at the front of the lot, with its blue paint shining from a fresh wash by the Minikuru staff. 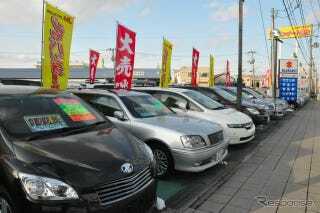 True to their word, the invoice showed the cost of the car was just 980 yen.Our attentive dealer had even agreed to take care of the necessary paperwork to register the car and set it up with liability insurance for the next eight months. Even adding in taxes and sales processing fees, the total price we paid to drive off in our Minica was just 89,800 yen (US $880)." Because my mechanical knowledge is limited, I tend to avoid these low budget rides, but this amazing story just added one more thing to a very long list of reasons why I need to visit Japan. At this point I expect all of you to put your work productivity aside and spend the rest of the day scouring Goo Net and Car Sensor Net to find the coolest, cheapest, JDM car you can. You'll thank me later.